So, I decided to buy Pokemon Sun after all. I happened to be down at Melbourne Central for unrelated reasons at around 5:20pm on Friday, 18th November. As suspected, Big W had no stock when I meandered in there so late, and they didn't even put a sold out sign out. EB Games had a line snaking out the door, but they price matched Big W for $46. I hope the staff there got paid overtime, because they looked pretty weary. As usual, here's a brief review of my experience. Please refrain from reading if you have not yet finished the game and still wish to be surprised. I'll admit it - I wasn't actually going to play this game. It's the same formula every time, the characters are getting stranger, the art is getting less pretty, and they're all getting more awkwardly 3D with every instalment. Even I know these things. Everyone who's played these games more than a few times know all this. But they usually won't admit it. So why did I change my mind? Alolan Ninetales, that's why. - Z-Moves: Overpowered moves that you can use once per battle. 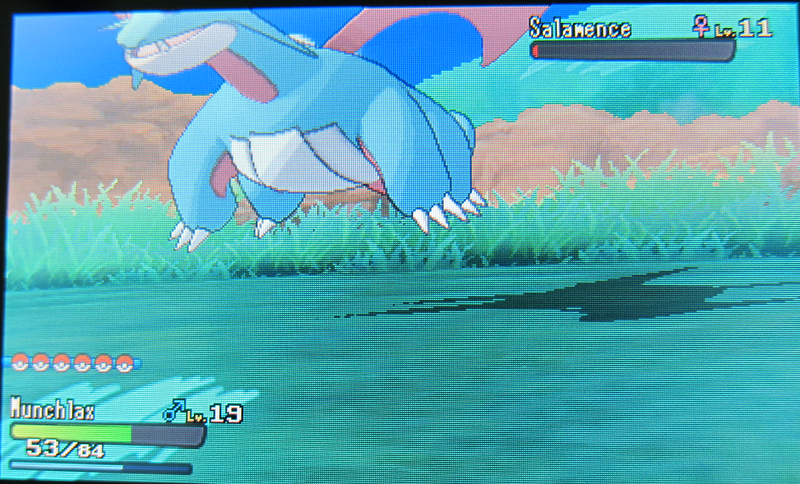 I never even bothered to use them, because I had a friggin' Lv.11 Salamence. - Alola Forms: A few Kanto Pokemon have different artwork and typing in this region. These were the main draw of this game, and I used Alolan Ninetales and Raichu. - Trials: Don't be fooled, these are the equivalent of Gym battles. The only difference is that the process is dragged out for longer, as you are forced to play Fetch Quest before facing the Boss... I mean, Totem Pokemon. Apparently you can catch them? I didn't know that while I was facing them though, so no difference for me. There are also 4 Grand Trials, which are much the same as facing Gym Leaders. - Battle Royal: This is a 4 way battle mode where the winner is not immediately obvious. Didn't find this mode interesting enough to try it again. - Poké Ride: You now call specific Pokemon to aid you instead of having teach your own Pokemon HM moves. A lot faster and more convenient, as long as you don't think about it too much. Such as, what happens when more than one trainer calls for a Ride Pokemon at the same time? Are there millions of the same Ride Pokemon? Do they never have anything better to do, like eat or sleep? Anyway, still a welcome change. - Poké Refresh: In order to heal your Pokemon of any status condition, just wipe them down with a cotton swab! Also, patting them and feeding them magic beans will make them much more useful in battle, dodging and landing critical hits left and right! 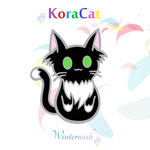 It is a time sink though, as it takes forever to reach maximum affection with this thing. - SOS Call: Wild Pokemon call for help now when they are struggling in battle. This means you can easily chain for evolved forms, higher IVs, and shiny Pokemon. I quite liked this new mechanic, but it takes forever to find what you're looking for. 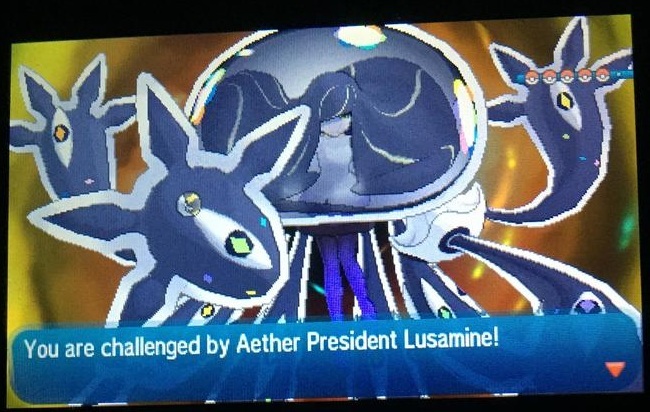 - Ultra Beasts: These are... not-Pokemon from another dimension. Except they are Pokemon, because you can catch them? I really wasn't paying that much attention with these things, as I was too lazy to go and hunt them all down after the game ending. - Tropical Islands: They're like the Orange League Islands, but more tropical. A nice change of scenery, but noticeably slow loading times and jagged 3D. So... yeah. Actually, there isn't anything too new or nostalgic here. 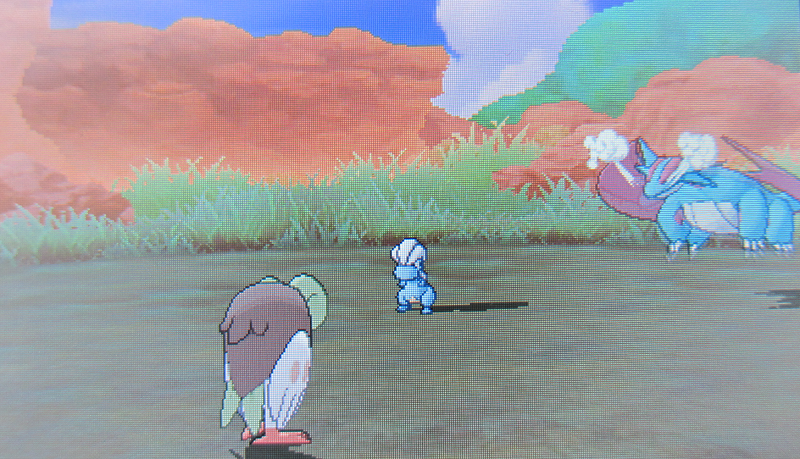 I picked the Grass starter for once in this game. I would have gone for Litten, but that bipedal wrestler third stage really put me off. I have to say that Rowlett is really a good Pokemon. Nice design, good third stage typing, varied move pool. That's more than I can say for any new starter since... Gen 3? Well done, Nintendo. You created the first good starter since Mudkip! 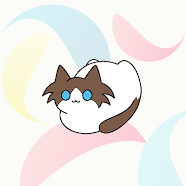 But please, dock the pay of the guy who thought a cute kitten evolving into a muscular man-wrestler was a good idea. 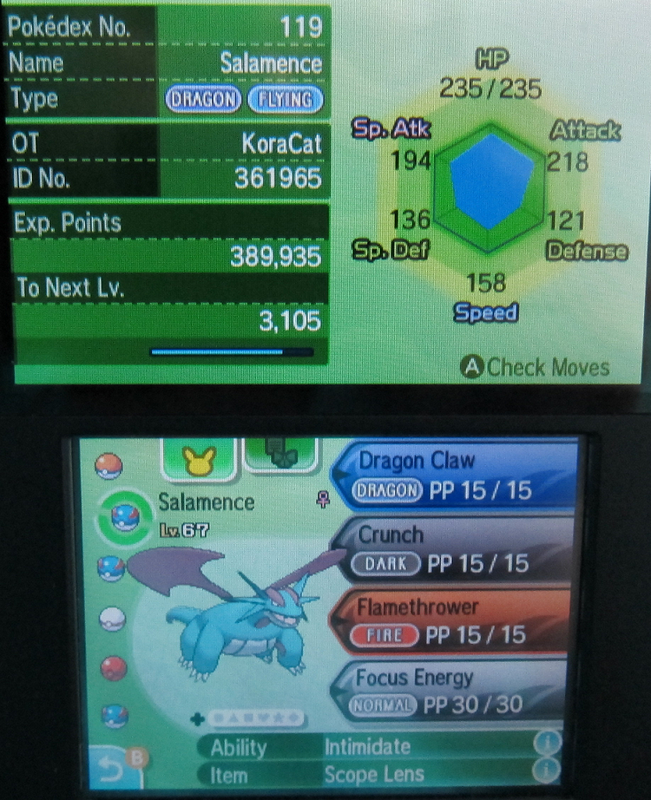 Knowing I could acquire both Salamence and Growlithe very early in this game, I didn't trade or use any outside help for my journey through Pokemon Sun. And it was easier than expected! 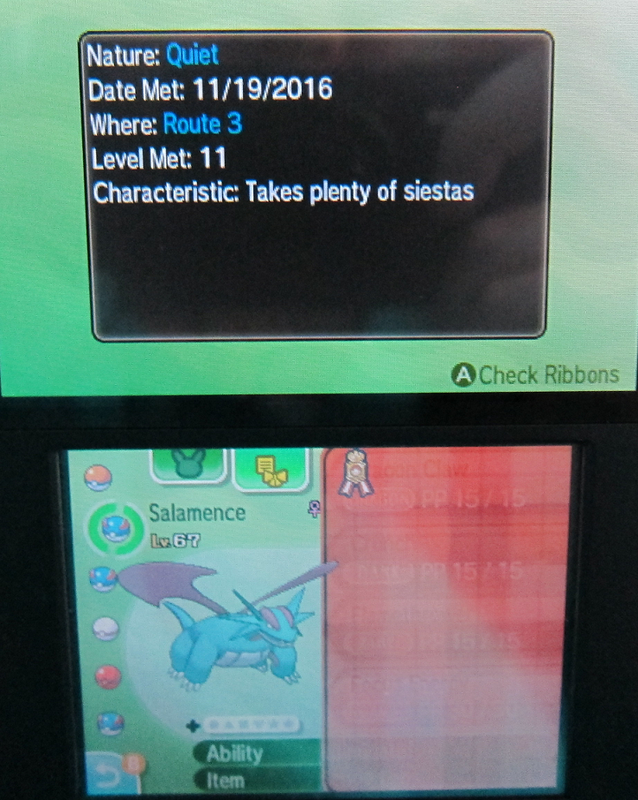 I found a Salamence via SOS chain on only my 4th wild Bagon chain encounter. 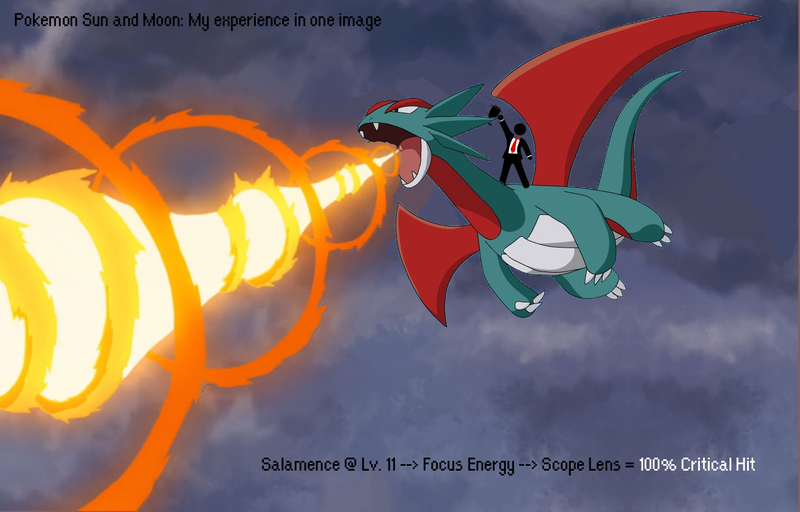 Well, the Nature wasn't great, but a Salamence is still a Salamence. 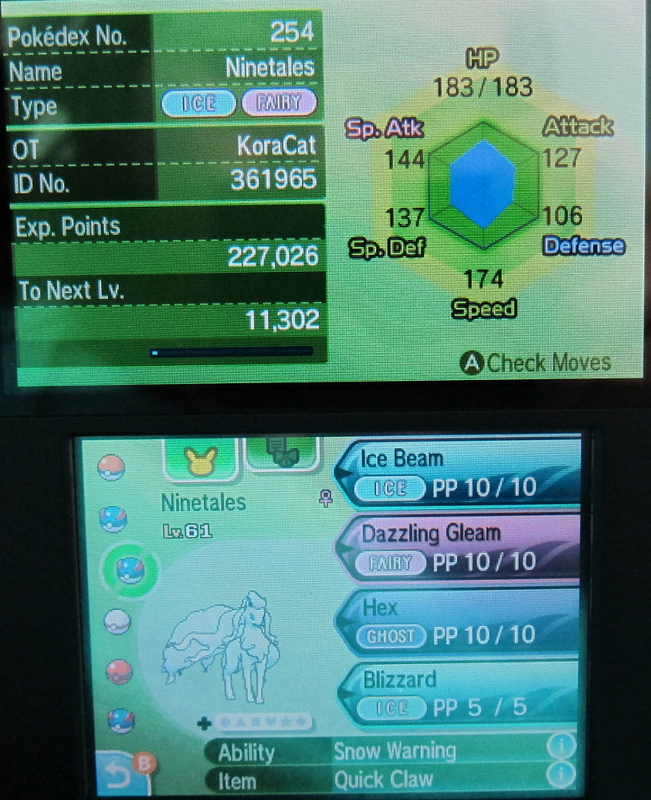 The Mystery Gift Munchlax with the move Hold Back also came in very useful. So much in fact, that Snorlax took a slot on my team without me really realising it. 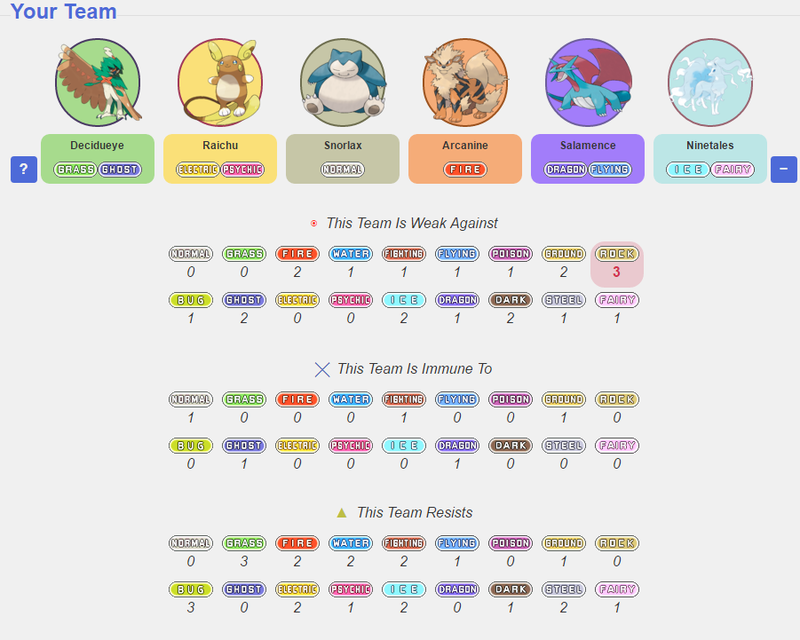 Unlike the usual teams I use, my Sun team was missing a token bulky water type and ended up being a bit unbalanced. It was glaringly vulnerable to anything carrying Rock/Dark/Ghost type moves. 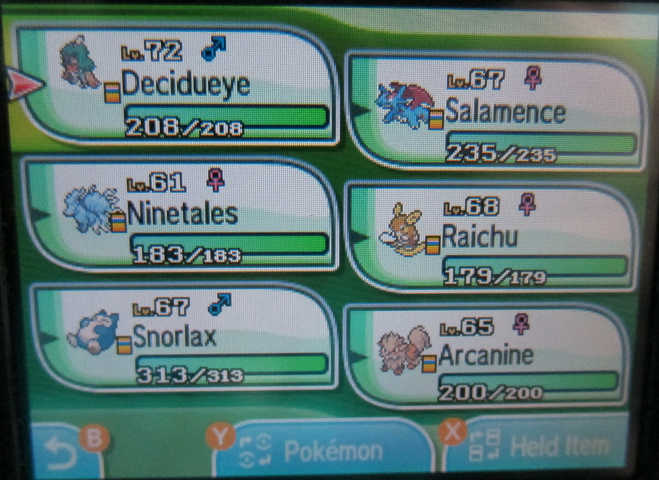 I used Slowbro up until I replaced it with Alolan Ninetales, because I already had a Psychic type in Alolan Raichu. This only made my Rock weakness worse, which was made very apparent when Blue's Aerodactyl nearly took me out on what would otherwise have been an easy battle. 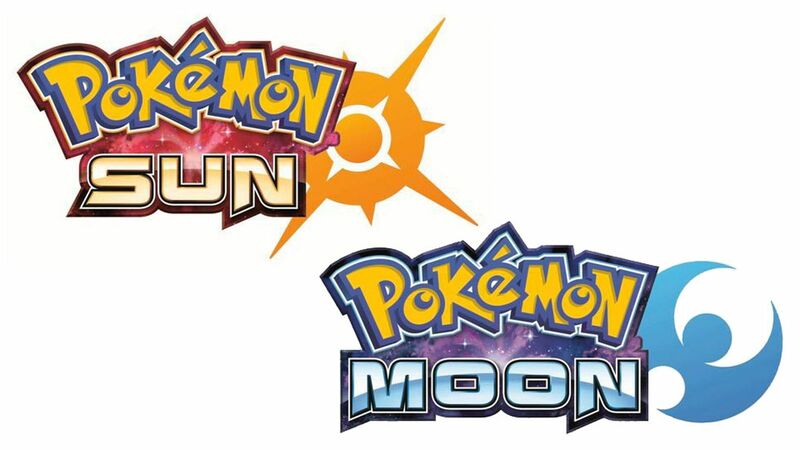 I would describe the gameplay in Sun as drawn out and linear. I was already 4-5 hours into the game before I faced my first Trial. You can't just go down any road you want here, there's always some guy or a Tauros blocking your way. A lot of the doors to buildings and rooms in this game also seem to be just for show, as they either don't open or don't go anywhere interesting. However, the game does allow you to randomly sleep in stranger's beds and judge their personal hygiene. Uh... Yay? The Totem battles were definitely more challenging than normal Gym battles, as they are essentially two on one. Your Pokemon might actually get hit or even faint here. In previous games, you could steamroll most of the Gyms without a scratch, so long as you had the type advantage. I can actually remember the faces of the Trial Captains in this game, while I can't remember anything about any Gym Leader past Gen 3. Most of the music is rather forgettable with the exception of two tracks. The first is Hau's battle theme, which is easily the most memorable tune in the game, although the catchiest part of it ends in the first few seconds. The second is the Skull Grunt battle theme, which is not so much music as it is garbled rap, but it's somehow still memorable in an odd way. Speaking of Team Skull, I'm not sure how I feel about them. They are most definitely different, but a kind of stupid different. Is there no group who feels like they are being mocked as a stereotype here? Do American gangsters continually make hand motions like that in real life? Is nobody insulted about this? I'm not entirely sure what their purpose was either... I think it had something to do with stealing Pokemon for the Aether Foundation so that Ultra Beasts could be summoned? I dunno. The plot of this game is rather hazy, but basically some lady goes insane and fuses with a jellyfish while in another dimension. At least it still made more sense than the plot of X/Y. 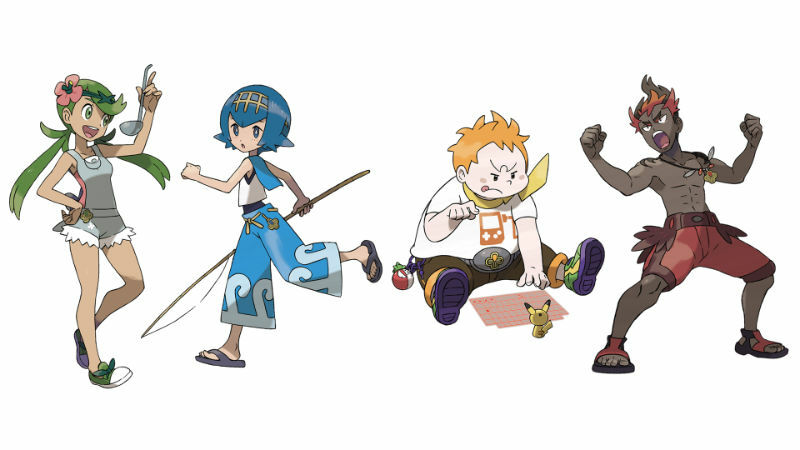 I was hoping that the Elite Four would consist of old Kanto characters, but it's mostly made up of Alolan Trial Captains whom you've already met. 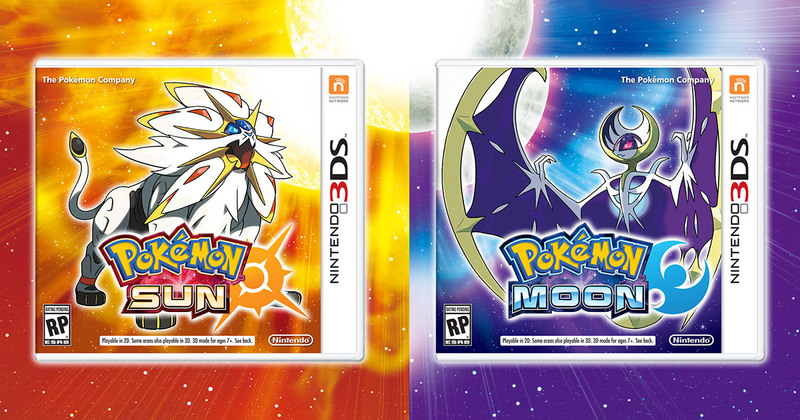 I was honestly expecting Blue, Red or Professor Oak's twin cousin to be part of the Champion battle line up. I was looking forward to learning about what they had been up to since becoming Kanto Champions. How long did Red stand atop Mount Silver? When did Blue quit being Viridian's Gym Leader? 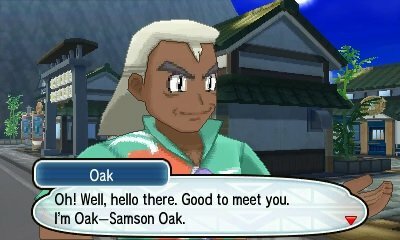 Why has nobody acknowledged until now that Professor Oak has a twin cousin who looks like an older, tanned surfer version of him? Alas, these questions will never be answered. Blue and Red make a brief cameo at the Battle Tree, where it is explained that they were called there from Kanto to be the bosses. 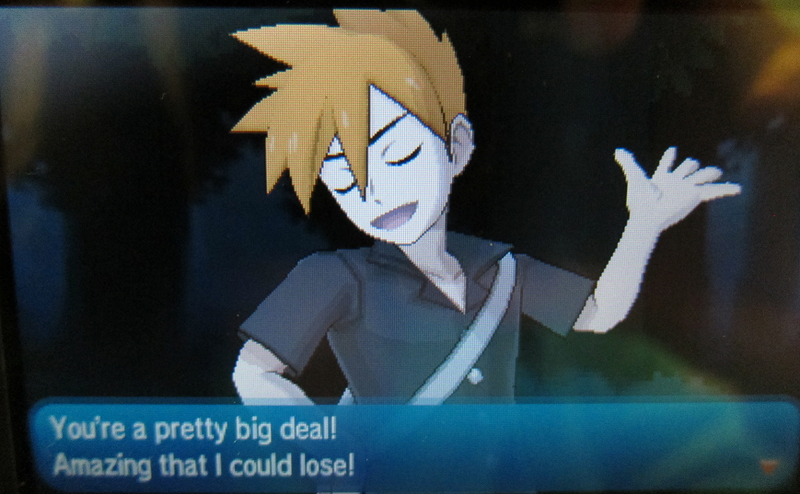 Red still retains a bad case of silent protagonist from his G/S days, so it looks like we'll never understand the depths of whatever horrors he witnessed at Mount Silver. Hope you remembered more of the new Pokemon than me! The only one I considered using in game was that sea cucumber bunny (Pyukumuku), before I realised it had no attacking potential. 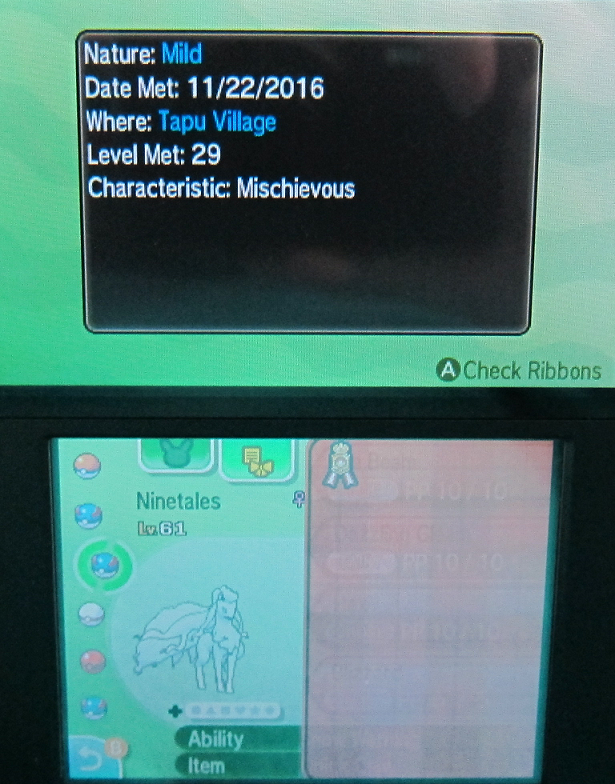 I did SOS chain and capture about 10 Snow Warning Vulpix, but unfortunately most of them had terrible Natures. The trainer customisation in this generation is notably worse than X/Y, as all the clothing has a floral and baggy style. I get that the game has a tropical vacation theme, but that's no reason to resort to unattractive fashion and boring hairstyles, right?